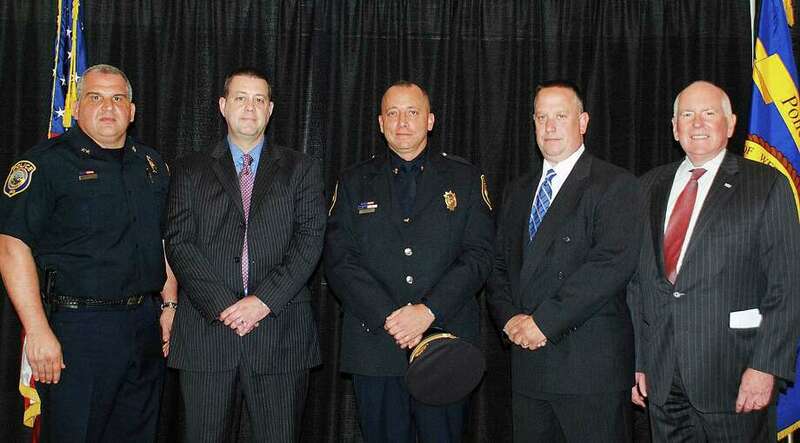 From the left to right, Chief of Police Foti Koskinas, Officer Robert Cole, Sergeant David Librandi, Officer Joseph Velky, and First Selectman Jim Marpe. WESTPORT — On Thursday, June 2, the Westport Police Department welcomed two new officers to the organization and promoted another to the rank of Sergeant. The ceremony took place in the Westport Police Department classroom, where First Selectman Jim Marpe administered the oath of office. Desk Officer David Librandi was promoted to the rank of Sergeant. Sergeant Librandi is a 12-year veteran of the police force, joining the department in February 2004. He served as a field training officer for several years, was appointed to corporal in June 2014, acting desk officer in March 2015 and full desk officer in April 2016. Sergeant Librandi has received several awards during his career including the department’s Medal of Valor in 2008. He lives in Stamford with his wife Michele and two children. Officer Robert Cole comes to the Westport Police Department following a 21-year career with the Orange Police Department, where he recently retired at the rank lieutenant. Officer Cole received a Bachelor of Arts degree in history from Niagara University and lives in Milford with his wife Dawn and 5 children. Officer Joseph Velky joins the Westport Police Department after a 28-year career with the Trumbull Police Department. Officer Velky served in several assignments in Trumbull, including recruitment and selection and communications. He is also a certified police diver. Officer Velky spent time as the Trumbull PBA president. He lives in Monroe with his wife, Karen, and daughters, Jennifer and Megan.